JERUSALEM — It was a typical day at the shrine around what many believe is the tomb of Jesus in Jerusalem’s Old City. A Greek Orthodox choir sang inside a room facing the baroque structure. But the voices were drowned out when chanting Armenian priests and monks circling the shrine raised theirs. “Sometimes they punch each other,” Farah Atallah, a church guard wearing a fez, observed with a shrug. 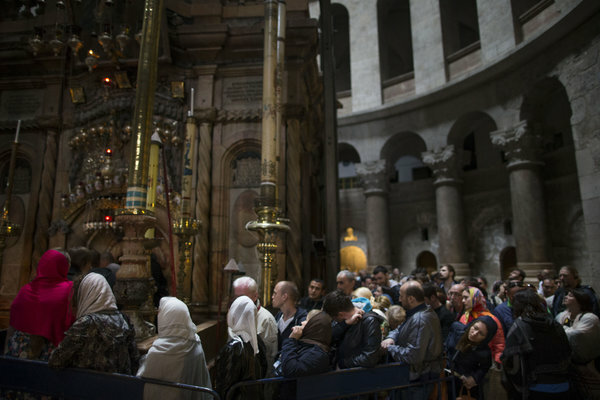 Mr. Atallah is a seasoned witness to the rivalries among the Greek Orthodox, Armenian Orthodox and Roman Catholic communities that jealously share — and sometimes spar over — what they consider Christianity’s holiest site, inside the Church of the Holy Sepulcher. Amid the rivalry, the unsteady 206-year-old structure, held together by a 69-year-old iron cage, is an uncomfortable, often embarrassing symbol of Christian divisions, which have periodically erupted into tensions. In 2008, monks and priests brawled near the shrine, throwing punches and pulling one another’s hair not far from the tomb where Christians believe Jesus was resurrected. But in recent weeks, scaffolding has gone up a few feet from the shrine in the gloomy shadows of the Arches of the Virgin, the first step in a rare agreement by the various Christian communities to save the dilapidated shrine, also called the Aedicule, from falling down. The March 22 agreement calls for a $3.4 million renovation to begin next month, after Orthodox Easter celebrations. Each religious group will contribute one-third of the costs, and a Greek bank contributed 50,000 euros, or $57,000, for the scaffolding, in return for having its name emblazoned across the machinery. The idea is to peel away hundreds of years of the shrine’s history, clean it and put it back together. Simple enough, but delayed for decades because of the complicated, centuries-old rules and minute traditions — called the status quo — that define the way Jerusalem’s holy sites are governed, in which the very act of repairing something can imply ownership. The inspiration for this unity was the threat of losing the shrine altogether. Alarmed by reports that the shrine was at risk of collapse, the Israeli police barricaded it for several hours on Feb. 17, 2015, throwing out the monks who guard it and preventing hundreds of pilgrims from entering. The message was clear: Fix it, or else. So after a year of much study and negotiation, monument conservation experts plan to first remove the iron cage that Jerusalem’s colonial British rulers built in 1947 in a prior effort to keep the Aedicule from collapsing, after a 1927 earthquake and rain left the structure cracked, its marble slabs flaking. They will take apart, slab by slab, the ornate marble shell built in 1810, during Ottoman rule of Jerusalem. The conservationists will then tackle the remains of the 12th-century Crusader shrine that lies underneath. That was erected after the Shiite ruler of Egypt, al-Hakim, destroyed the first Aedicule in 1009. The original was built by Helena, the mother of Emperor Constantine, the Christian Roman emperor who did much to elevate the status of Christianity through the empire. Antonia Moropoulou, the conservation expert heading the project, said the shrine would remain open to visitors during most of the painstaking process. Hundreds of pilgrims waited to enter one recent day as Catholics said Mass near the Aedicule, blocking the entry with wooden pews. The shrine is topped with a large gray cupola, and it is decorated with gold, icons, pillars, candles, heavy bronze lamps, inscriptions and a large painting of Christ. Two women from the Eternal Sacred Order of the Cherubim and Seraphim, in Nigeria, wearing matching blue dresses and head scarves, walked shoeless into the Aedicule, crossing the Chapel of the Angel, with its walls of elaborately carved marble and proclamations in Greek. They bent through the low door into the Chapel of the Holy Sepulcher, where, under oil lamps, two white marble slabs denote the location of Jesus’ rock tomb. The two women fell to their knees, raised their arms in supplication and fervently whispered prayers. They wiped their hands and photographs of children on the slabs. 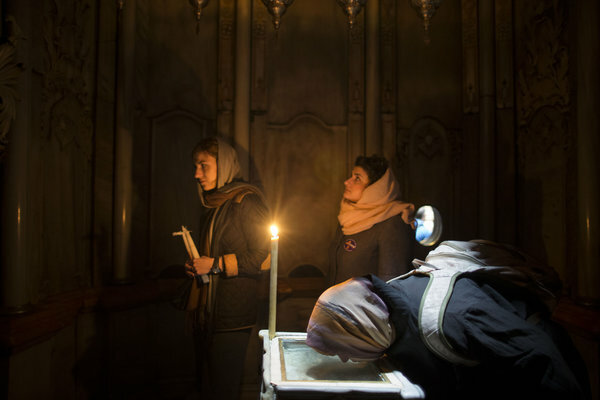 Another day, a line of Indian Muslims squished against South Korean tourists, Indian nuns and Arab-American Christians stretched past the Chapel of the Copts, a room attached to the back of the Aedicule, where a monk guarding the site was engrossed in his smartphone. The three Christian communities vigilantly guard the property they already control to an extent that can feel baffling to outsiders coming to the Holy Sepulcher, a cavernous jumble of Byzantine and Crusader architecture, with soaring domes, sunken rooms, gloomy light, heavy bronze lamps, squat buttresses and elegant arches. In the church entryway is a gaudy gold mosaic on a wall, owned by members of the Greek Orthodox Church, that distracts from the nearby Stone of Unction, the marble slab covering the site where Jesus was anointed. Beside the mosaic is a ladder owned by Catholics, who will not move it. It is next to an Armenian-controlled walkway of a few feet leading to the Aedicule, where non-Armenian priests in vestments may pass, but not stand, because that would suggest they are challenging Armenian control. The last significant renovation began in the 1950s, when the Jordanian authorities who controlled East Jerusalem at the time pushed Christian representatives into forming a technical bureau to address the 1927 quake damage. But the process broke down more than a decade later, according to Father Macora. After the last embarrassing dust-up, in 2008, which was captured on YouTube, the rival communities began trying to fix their relations in earnest, repairing the toilets as a good-will measure. In 2014, Pope Francis met the Ecumenical Patriarch Bartholomew I of Constantinople, the spiritual leader of Orthodox Christians, at the Aedicule, to promote unity. The Orthodox Christian Network (OCN) is an official agency of the Assembly of Canonical Bishops of the United States of America, originally commissioned by SCOBA to create a national, sustainable, and effective media witness for Orthodox Christianity throughout North America. In a constantly changing media landscape, OCN delivers positive, relevant Orthodox content via multiple delivery platforms, reaching today’s internet users via broadcast, video, blogging, and webinar content. This 501(c)3 is recognized as a leader in the Orthodox Media field and has sustained consistent growth over twenty years. OCN shares the timeless faith of Orthodoxy with the contemporary world through modern media. We are on a mission to inspire Orthodox Christians Worldwide. We have reached 5.7 Million People in One Week. Much like public radio, the Orthodox Christian Network relies on the support of our listeners, readers, and fans. If you are interested in supporting our work, you can send your gift by direct mail, over the phone, or on our website. Your gift will ensure that OCN may continue to offer free, high-quality, theological media. NEW OCN MOBILE ORTHODOX APPS ARE HERE! Orthodox Christian Network brings you news of events and people important to the life of the Orthodox Church around the world. OCN highlights media organizations that track these important stories.